The Conference Cultures, Hopes and Conflicts. 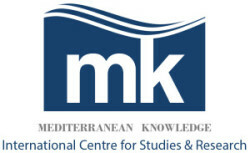 The Mediterranean between Land and Sea, jointly organized by the ICSR Mediterranean Knowledge and the Consortium Mediterranean Worlds, aims to collect contributions that address the most important questions related to the Mediterranean Basin from the point of view of different social and human sciences. Nowadays, the Mediterranean is affected by major changes. The social role of territories has changed: not only people are able to move and travel in a less expensive and easy way, but an increasing number of people can build their identity with multiple senses of belonging. These changes paved the way for new opportunities for multipolarity and also give new opportunities to territories historically destined to marginalization. 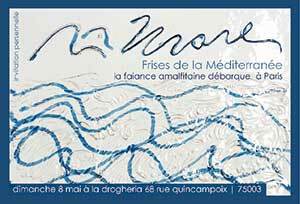 The aim of this Conference is thus to increase awareness about the Mediterranean as a departure and arrival point for the construction of a pluralistic society, starting from a great variety of cultures, societies and ways of life. We also aim at disseminating the research results on such topics. On the basis of these considerations, the Conference is open to contributions that address the great questions concerning the Mediterranean, the cultures and the societies developed on its shores. Next meeting is the Conference “Migranti tra allarmismo e risorsa sociale”, expected at the University of Salerno on 23/24 November 2016. The Conference aims at increasing the existing corpus of theories on political and social conflicts among society and individuals, on the impact of mobility, on the role plaid by the symbolic dimension in the interaction and adaptation processes, on the policies of school inclusion and of access to the services. It is no longer sufficient to know how many are the foreigners and which are the socio-demographic features, but it is needed to individuate what migrants represent in terms of behaviour, way of life, cultural models, as well as what are their needs and their expectations. The hypothesis is that the existential condition of migration drives to the formation of multiple identities, more and more diasporic, de-territorialized and recomposed at individual level. In this scenario the integration of migrants is due to bilateral processes, that are significantly influenced by the social representations built by migrants about population and society of destination (before and after the arrival), as well as by the intangible resources put in place by them. In such a way migrants must be considered full social actors (bearers of stories, views, abilities) and the integration processes are not determined only by the framework of the hosting system but, at least in part, they are the result of the strategic paths followed by migrants, who act in a context where choices are made on the basis of particular social frameworks of knowledge. The initiative, of great scientific and social value, involve not only scholars of Italian universities, but also the Foundation Migrantes, the Ministry of Interior, as well as representatives of third sector and civil society involved in the different issues of migratory phenomena. Giulio Albanese’s In the Name of “god”: Victims and Oppressors (Nel nome di “dio”: vittime e carnefici, Einaudi, Torino 2016) addresses the very timely issue of the role played by religions in contemporary global world, with a special attention to the African continent. In the very same moment in which interfaith and inter-religious dialogue is recognized as a much needed tool for a pacific cohabitation among cultures, religious presuppositions are being ideologically used everyday as a tool to destroy the “Others”. Therefore, it is all the more important to carefully discuss this topic, which has clear implications also for the Mediterranean area. A Combonian father and a journalist, the author has been the director of the New People Media Centre in Nairobi, and the founder in 1997 of the “Missionary Service News Agency”, currently “Missionary International Service Agency (MISNA)”. He collaborates with several newspapers, among them “Avvenire” and “Giornale Radio Rai”, on issues relating to Africa and the South. The exhibition project titled “Mediterranean Friezes”, ideated and curated by the writer, advertiser and publisher Michele Citro (Edizioni Paguro), aims to honor the Magna Graecia through 12 Vietri lacquered ceramic metopes (45×30 cm) designed and handcrafted by the artist and ceramic master Luigi Manzo. The ceramic tables are designed to be thought or imagined as “traveling micro windows” opened upon the Mediterranean Culture. To reach the above-mentioned goal, it has been chosen to represent, allegorically and ideally, a sequence of well-selected topics. These topics are: 1) the Mediterranean Sea as the “White Middle Sea” (al-Baḥr al-Abyaḍ al-Mutawassiṭ – as Arabs call this sea) or, simply, the “White Sea” (Akdeniz – as Turkish people call it). 2) The personification and/or objectivation of three great continents that share this precious crossroad: Europe, Africa and Asia. 3) The embodiment of Poseidon, the god of the seas, who inspired the name of one of the most prosperous civilizations of the Magna Graecia: Poseidonia or Paestum. 4) The three main cultivations of this area: citrus fruits, grapevines and olives trees. 5) Fishing, essential element of the Mediterranean coast nutrition and economy. 6) The encounter between the seductive mermaids and the sharp and fearless Ulysses, the first explorer of these waters. 7) The concept of “route” as a metaphor and symbol of the meaning of meeting and exchange among cultures. 8) And, at the end, Philosophy, the great Greek philosophy that was and still is the basis for each reasonable Western and Eastern way of thinking. Mediterranean Friezes wants to be an exhibition of compromise, diplomacy, tolerance, good sense and of the magnificence of what can happen when climates, currents, techno-scientific knowledges and ethic-moral moods of different but complementary worlds meet each other. 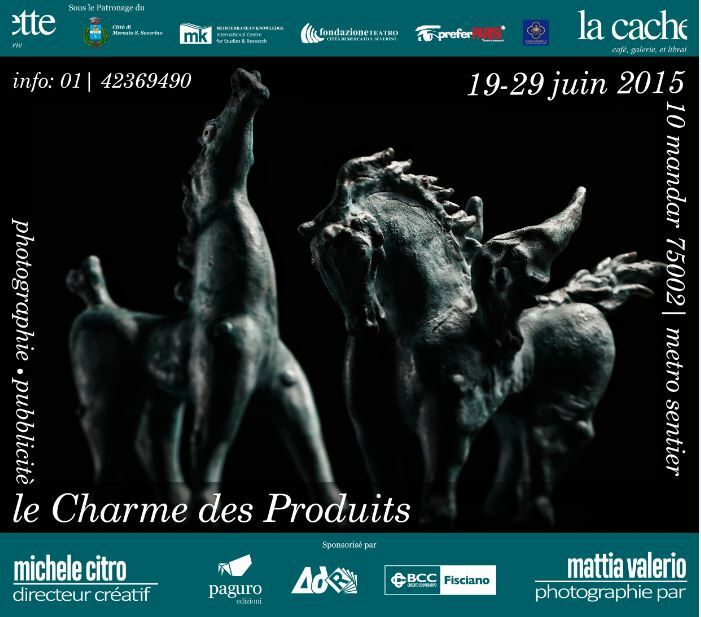 A photographic exhibition organized by the writer and advertiser Michele Citro and the still-life photographer Mattia Valerio at Culture & Art Gallery La Cachette (10, rue Mandar – Paris) from 19th to 29th June 2015. 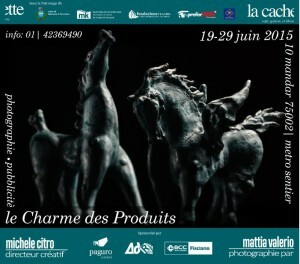 The event aims to value the craftsmanship hidden behind some kind of products (jewels, sculptures, industrial items, etc. ), most of them made in South of Italy in the middle of Mediterranean Basin. Through a set of photos able to highlight their aesthetic qualities besides the most simply commercial ones. The logic of Beauty supplants the one of Useful and Suitability. The Product, made by human intelligences and hands, becomes a privileged vehicle to convert the material element in lines, forms and light.